I truthfully wish I could make these ribs more often than I do! The Best Oven Baked Beef Ribs are so easy to make and the result is so tender the meat falls right off the bone. 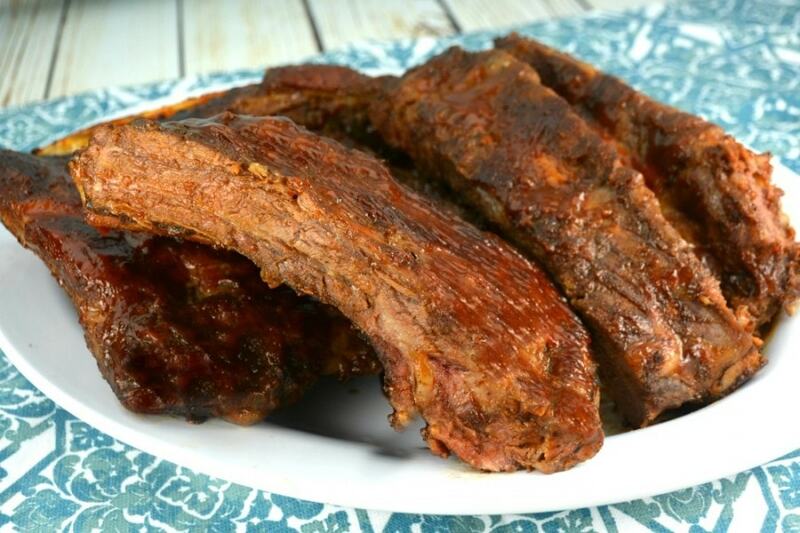 Seasoned and slow baked in your oven with your favorite barbecue sauce. In my opinion this is the only way to cook them! I always loved pork ribs and years ago decided to give beef ribs a try. After some fine tuning we came up with this recipe for The Best Oven Baked Beef Ribs and now it is definitely a family favorite! I get so many requests regularly to make these. Truth be told I wish I could make them all of the time but now we just make these on special occasions. You can’t eat them every day, can you? I have to get that thought out of my mind! 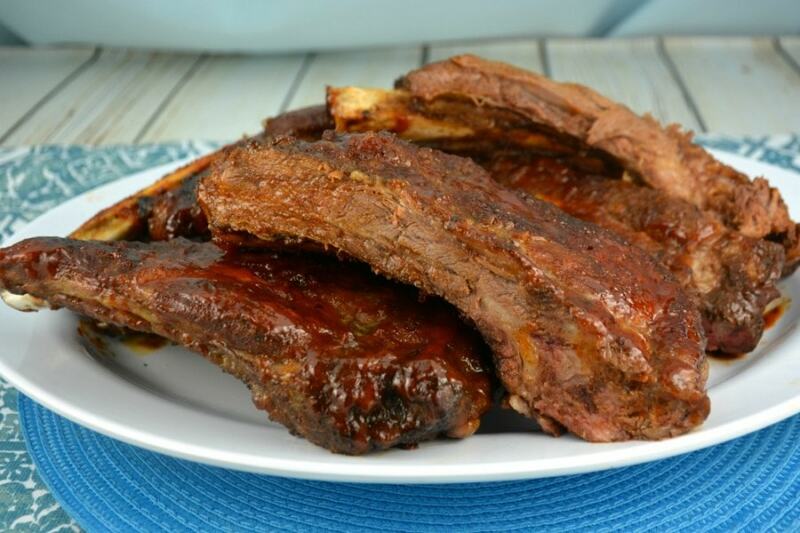 These Oven Baked Beef Ribs are so tender and flavorful you will not be disappointed! If you can handle some heat use cayenne pepper otherwise stick with regular pepper, I always do! My son is the only one who can handle heat in food as I just don’t seem to tolerate it like I used to! The most difficult part of this recipe is getting the silver skin or skin like membrane off the back of the ribs and I always try and see if the butcher will do it! Once you do that you will be surprised at how simple this mouthwatering recipe really is! Also, you have a choice regarding the barbecue sauce. You can make your own or buy your favorite brand but to be honest I usually buy a bottle. It saves time and I have a favorite I have been using for years. The choice is up to you! 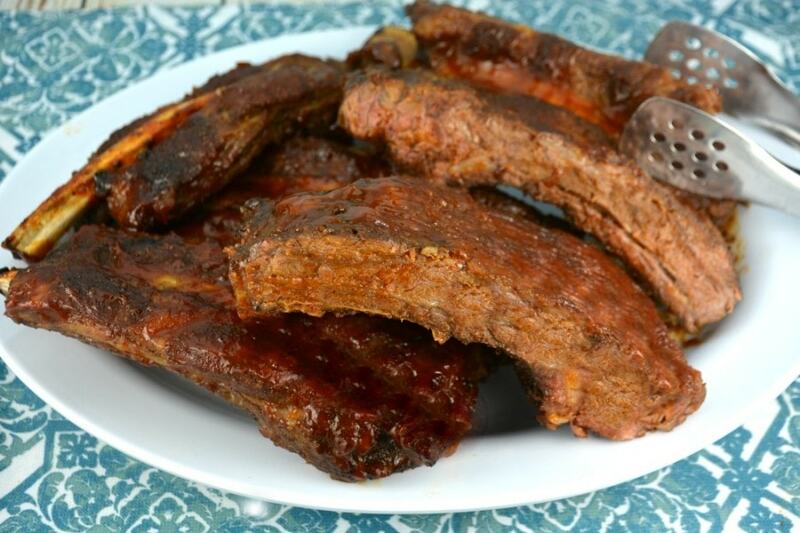 As some of you know we are a family of rib lovers and we just love making and eating ribs, including pork ribs as well. 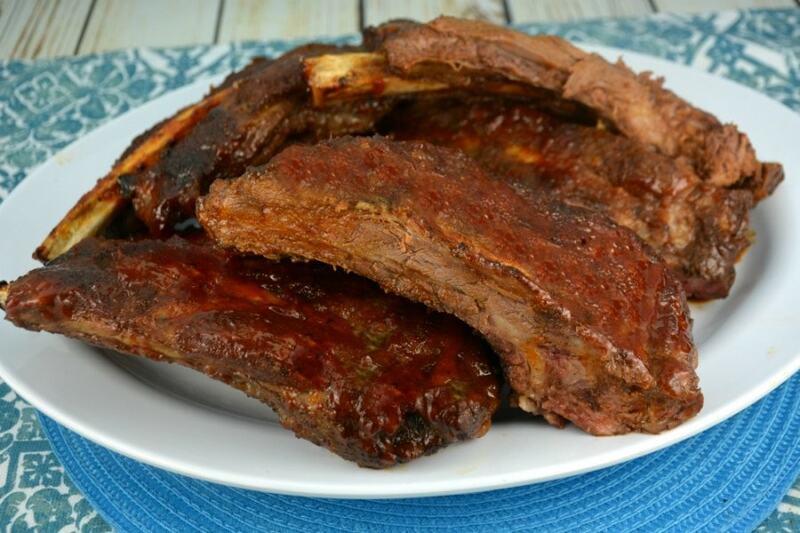 We get asked regularly to make our Ultimate Oven Barbecued Ribs and Simple Sweet and Sour Spareribs recipe at gatherings of all kinds! You might want to have a look at these recipes as well because you never know when you will find a keeper! We love this recipe for The Best Oven Baked Beef Ribs so much that we made a video you will find below! Prepare a large rimmed baking sheet with tinfoil and set aside. Tear 2 large pieces of tinfoil, large enough to totally wrap each rack of ribs, and set aside. In a small bowl combine cumin, paprika, chili powder, garlic, onion, salt, pepper and brown sugar. Mix well and set aside. Next, we recommend that you remove the silver skin or skin like membrane on the underside or back of the ribs. This is the worst part about making ribs but well worth it. Be patient and try not to give up. Start in the middle of the rack and scrape along the bone with your finger or a knife. You are trying to lift that membrane or skin up. Slide your finger under the membrane and slowly try to tear it off the entire rack. You may need to use a piece of paper towel to get a good grip. Hold your ribs down while you pull the membrane across the back of the entire rack of ribs. You can ask your butcher to do this when you purchase the ribs. It is not necessary but the ribs will taste better. You will be glad you did. Do the best you can. Repeat with your other rack. Rinse and dry ribs completely with paper towel after removing each membrane. Apply the spice mixture all over your racks, top and bottom. Use all of it and massage the mixture into the ribs. Place each rack on top of each piece of tinfoil and wrap up your ribs. Place the ribs with the bony side up or the meaty side down and fold the top and sides over so the ribs are totally sealed inside. Preheat your oven to 275 degrees. Do not pile your ribs on top of each another. Put the ribs into the oven, on the middle rack, for between 3 and 4 hours. After 3 or 4 hours, take the ribs out of the oven open up one pouch. We find that our ribs are finished at 3 1/2 hours. The ribs are done when you can see more of the bone then when you put it in. The meat will shrink. Using a fork check the meat to make sure it is fall off the bone tender. If they are not ready just reseal the pouch and bake for longer. Once ribs are cooked, remove from oven and set oven to broil. Remove tinfoil from each rack of ribs and place on your tinfoil lined baking sheet bony side down or meaty side up this time. Cover top of ribs with your barbecue sauce. When the broiler is hot, place your ribs under the broiler on the middle rack until barbecue sauce starts to bubble all over. Little brown or black dots may appear. This is good, do not worry. Remove ribs from oven and you now have two options. You can serve the ribs at this point or put more sauce all over the ribs and broil some more. Wait for the sauce to bubble all over again and then serve. Watch the ribs when they are broiling. They can and will burn quickly. Cut up the ribs, using a large knife, before serving, if required. Thank you so much for sharing. I already made it 5 or 6 time. This are the best ribs i ever eat. They are now in the over, about 2 hours they are ready. I’m making these tomorrow for my awesome boyfriend of 8 years. He LOVES beef ribs. The only thing is, I am using beef chuck ribs that are already cut. I’m crossing my fingers that it turns out right and that the cooking time is the same!! I loosely followed your rub/ marinade. Instead of the BBQ sauce I added Scotch whiskey and a splash of Lee & Perrins plus a little extra virgin olive oil. OMG. I’m a Brit, new to American eating. I have to say that this is the first time I have tried beef ribs. They were absolutely bloody delicious. Maybe I will marinade them longer in the Scotch !!!! 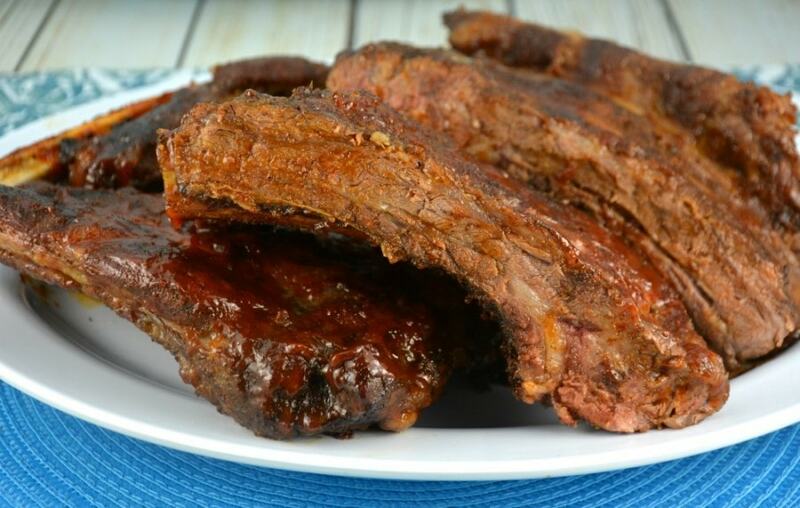 For 2 racks of pork back ribs, would you use the same cook time and temperature as these beef ribs? I bought two racks at Costco yesterday. Prime so I don’t want to mess it up. So… couldn’t sleep thinking about the prep. Finally this morning I came across your site. Wow! Exactly what I was looking for. I will keep you posted. I will bake in convection. The ribs were a hit. Thanks for providing the detailed recipe. Ours were juicy, crispy and will definitely use your recipe again. I’m thinking of getting a beef brisket next. I’ll be checking your site for that. We served with homemade potato salad and homemade coleslaw. Perfecto, thank you! I am sure I won’t hear from you right away but I thought I’d throw out my questions anyway. I am making beef ribs for the first time and could not find how many pounds the two racks you list as ingredients should be. I bought one 4.6 lb rack and figure maybe this is equal to two smaller racks? I was not really sure how to gauge per pound baking times. The other question I had was about temperature. Some recipes call for 250 and others go all the way up to 350 with the same about of cooking time listed (usually 3 to 4 hours). I guess this is why I am worried about how many pounds we are talking about in your recipe. I don’t want to over or under cook the beef. Thank you in advance for your reply… I am crossing my fingers I don’t do this wrong! I was searching all over for a good recipe, something with great flavor and I stumbled on yours! I absolutely love it, and it was so easy! Thanks for posting! I have my ribs seasoned and letting them marinade for at least 30 minutes then I will bake them. I like your presentation and recipe. It’s straightforward, detailed and I think I can do it. Thanks……I’ll let you know how it goes, maybe I won’t screw it up too bad.